Right then. Most of you have probably heard of Homedics; if you haven’t they specialize in manufacturing relaxation and wellness products. Knowing this, it doesn’t take a giant leap of faith to assume their foot spas would be pretty decent — after all, I’ve always been impressed with Homedic products. Today, the Blissful Relaxation team was lucky enough to test out two Homedic foot spas, which was good enough to be featured on our list of the best foot spas. 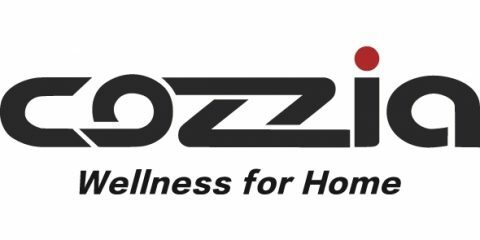 Now, their foot spas do sit on the lower end of the pricing spectrum, so we weren’t expecting the world, but we still had high hopes that a big brand like Homedics could deliver the goods. Did they out-perform other similarly priced foot baths? Let’s see how they did. The first of the two Homedics foot spas we tested was the JetSpa. This is the cheaper of the two products, and you can usually pick one up for a competitive price – Conair pricing territory. In all honesty, it’s a decent foot spa to look at. The blue and white color scheme, whilst not spectacular, does look nice. However, we were all concerned that it looked a little flimsy, and were in agreement that with regular use it might not last too long. The other thing to note about this foot spa is that it isn’t the biggest. Whilst it comfortably accommodated my small feet, those with larger feet — in particular men — might be a little disappointed. After filling it up with hot water, we switched everything on. The spa is advertised as a heated foot spa, so we were expecting a warm, relaxing experience. The JetSpa does come with a heating element, and it actually is pretty good, unlike the 300. The 300 used to be pretty weak, but the 600 can heat water as high as 98 degrees Fahrenheit. Don’t expect it to keep the water steaming hot, but the heating element is capable of prolonging your soak and keeping the water a nice temperature. Having tested out the heater’s capabilities, it was time to test out the bubbles. I actually really enjoyed them — the bubbling motion was very soothing, though the machine was a little on the loud side. In addition to the bubbles, there is also a couple of water jets which sit above the surface and shoot water down onto the tops of your feet. Personally, I loved this sensation, and I found it quite therapeutic. The JetSpa comes with three attachments which are placed in the center of the spa. These include a pumice stone, an exfoliating brush, and a circular massager. Apply some pressure and the machine slowly rotates the attachment, making your life a little easier. I found the attachments to be reasonable, but the quality was a little on the low side — no huge complaints from anyone, but nobody was singing their praises either. At the bottom of the basin, there is a raised node which you can press your foot down on to relieve some tension. These things are never spectacular, but the node on the JetSpa was average at best. Everyone agreed that it didn’t do much for them, and you had to press down hard to feel any real benefit. Relatively cheap, I have no complaints at all about the JetSpa; after all, you get what you pay for, right? Being built by Homedics though, we were expecting the product to be punching about its weight. It didn’t really, but the price point still reflects fair value. 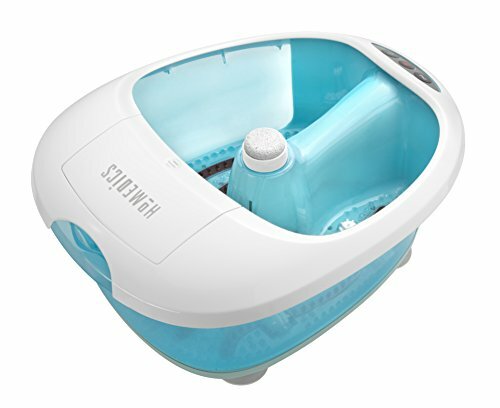 Overall, it is a solid foot spa that actually keeps the water temperature pretty hot. 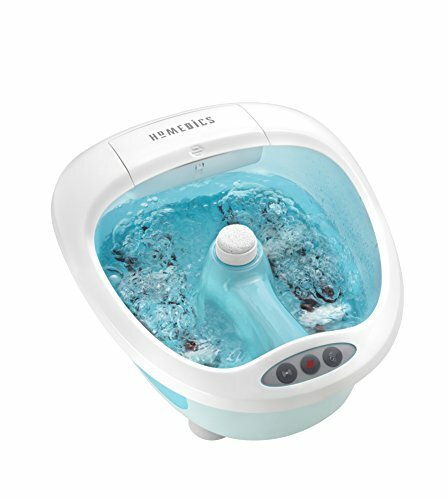 The second Homedics foot spa we tested out was the Hydro-Therapy Foot Massager. This foot bath was a little more expensive than the JetSpa, but still cheap in the grand scheme of things. Out of the box, we liked the look of this foot spa a lot. It was refreshing to see Homedics had gone for something other than the typical white and blue we see so often. The silver color was much more masculine, so men would probably be happier to have this knocking around the house, but this group of ladies still found it very stylish. The Hydro-Therapy spa also comes with lights, and when the basin is full and everything is switched on they look great. Admittedly, you probably won’t spend your time in the spa looking down at your feet, but it was a nice touch. As with the JetSpa, the heating element is fairly ineffective. The water will gradually cool, but the heating element will still give you an extra half hour to soak — how long are you planning to stay in there, anyway? Homedics call this a massager, as instead of spa-like bubbles, the machine vibrates. Now, there are better vibrating functions out there, but the Hydro-Therapy Spa performed well — if you suffer from foot pain, this foot bath could be a huge help. As well as the vibrate function, there are also some water jets. They sit above the surface of the water (depending on how high you fill!) and spurt out water in four directions onto the tops of your feet. I really liked this sensation and found it very soothing. Like with the Conair Waterfall spa, the innovation at the bottom end of the price range is impressive, and it would be great to see the top-end spas attempting something like this. There are also a number of elevated “pressure points”, including a large one in the center. You can apply pressure to these to ease the tension in your feet. Whilst there were no real complaints about these, most of us agreed that they didn’t really do much, but I suppose they are worth having. The last consideration was the price. In the middle range of pricing for foot baths, I thought this spa represents great value. It looks nice and provided a good foot spa experience, which more than justified the price tag in my opinion. Overall, we were left feeling satisfied with the Hydro-Therapy Foot Massager. Other than the heating element (which is average) everything else works well. Despite this, something just didn’t sit right with us — we unanimously agreed that if you could stretch your budget by a few dollars, the Hot Spa is a far better machine.